Health testing is very valuable to us. Every dog that we intend to breed will undergo these health tests. We think it is important to get a lot more transparency about the outcomes of these examinations. This is why the results of our dogs are published on our website. You can find them on the page of the dog itself. During the sharing of this information we noticed that a lot of people have trouble interpreting the results. Maybe they don’t understand why that particular disease is tested for, of they do not understand the outcoming. On this page we try to explain why we conduct the tests we do, and how to interpret the results. When you are on the lookout for a French Bulldog puppy, it is important that you have a bit of knowledge about the outcome of the health tests. It is also important that you know the common diseases that can occur in French Bulldogs. On the Health page you can find a lot of informaton! 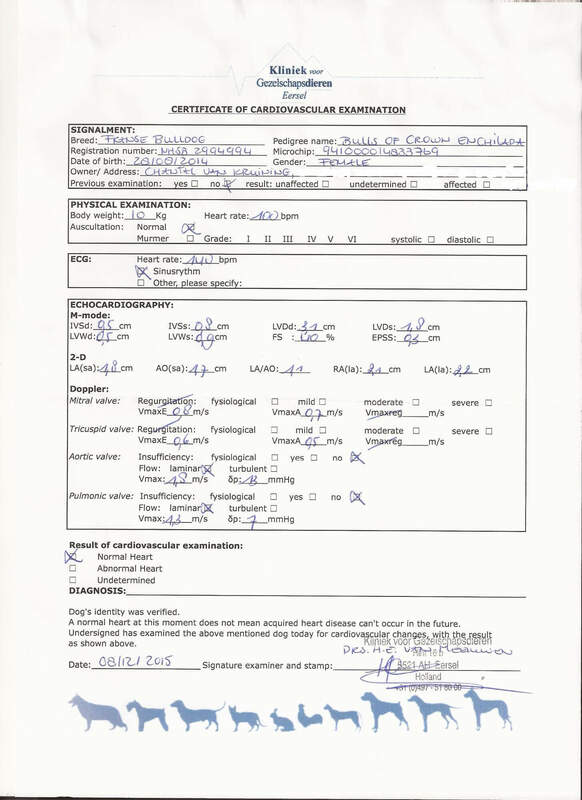 Unfortunately, Raad van Beheer (our kennel club) does not require any health testing for French Bulldogs. 2 dogs can be bred without a single test and you will get an FCI pedigree for the puppies. Breed clubs do require someting, but it is not much. The testing consists of a patellar luxation exam, listening to the heart and the dog must walk 500 meters in 5 minutes. We think this is nowhere near enough! That is why we made our own protocol and do our own health tests. All the testing we do is voluntarily, unfortunately none of these is mandatory. On the tabs below you can look into every test we conduct and you can read why we chose to perform this test. In lack of a good independent document to document the physical exam I made a protocol of my own. On the right you fin dan empty version of it. With the arrows you can scroll through. It is downloadable for everybody on the ‘Documents and Links’ page. There are different points on the list. 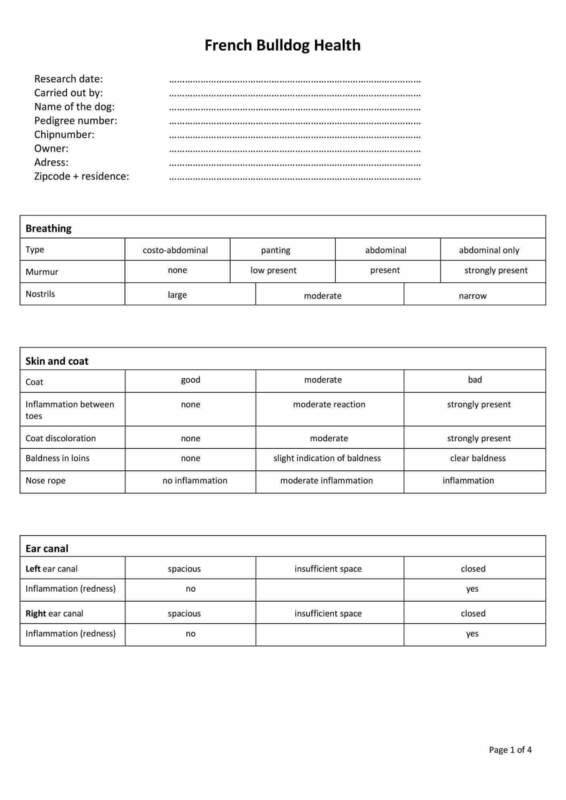 Breathing: The type of breathing is recorded and any murmur is recorded what could be an indication for breathing problems. Skin and coat: The condition of the skin and coat can give an indication if there are any allergies present. The coat is checked for discoloration, bald spots of inflammation between the toes and facial wrinkles. Ear canal: Because of the shape of the head there can occur an ear canal that is not wide enough. It can cause inflammation. Eyes: Diseases can also be found on the page ‘Eye Abnormalities‘. The lacrimation is measured because sometimes due to lack of muzzle the tearducts are constructed wrong. There will be checked for cherry eye and the cornea is judged. If no ECVO eye exam is executed then also entropion, extropion and distichiasis are checked. Knee joints: Patellar Luxation is common in French Bulldogs. It is important to document this disease well. Hip joint: A luxating hip joint can be an indication for Hip Dysplasia and it is an indication for shallow hip sockets. Next to this exam our dogs also will undergo an official HD exam. Tail: Because of the short and kinked tail sometimes the tail gets ingrown This is very painful for the dog. Throat anatomy: An important part of this protocol is inspection of the throat area. The dog must be anestathized for this exam. There will be checked for a too long of thick soft palate, if the tonsils are normal and that the larynx is normal in shape. The diameter of the trachea is measured by x-ray. These are all clues for BOAS. Spine: X-ray pictures will be made of the entire spine. We check for deformations of the vertebrae (hemivertebrae), presence of spondylosis or calcifications of the interverbral discs. Together with the physical examination we perform x-ray images on our dogs. The French Bulldog is a dwarf dog breed and because of their compact structure skeletal disorders are common. A lot of these disorders are hereditary. With x-ray images we can get ourselves a good idea about the skeletal health of the dog and it’s airways. The entire spine: Unfortunately, abnormalities in the spine are very common in French Bulldogs. On this page you can read more about it and I show you what to look out for in an x-ray picture. It is important that every vertebra is shown on the x-rays, this is why we x-ray from neck- to tail vertebrea. That way we can get the best picture of the spine. 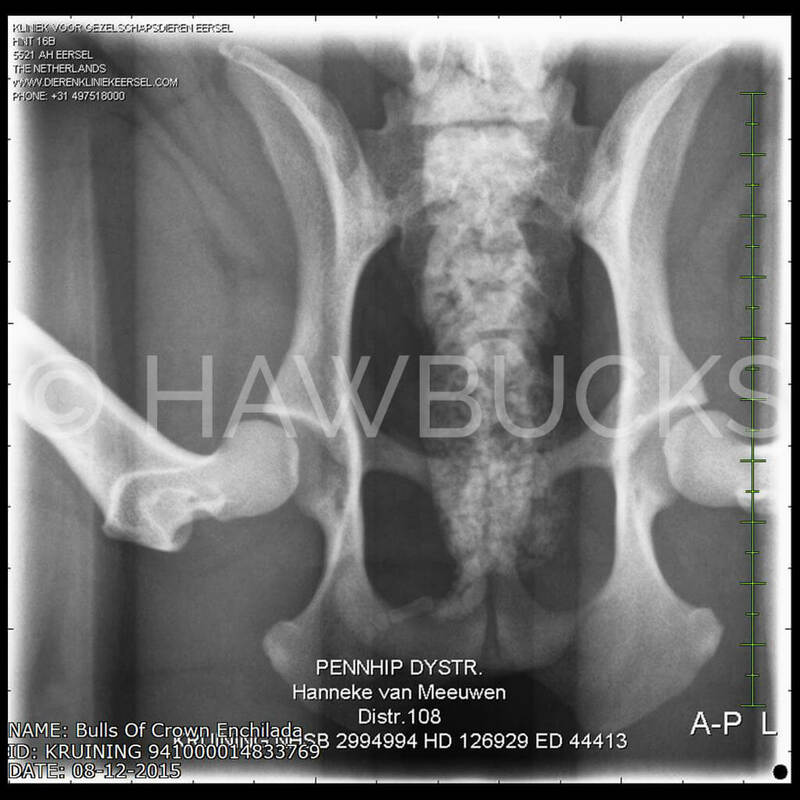 Hips: In the tab ‘Hip Dysplasia Examination’ and ‘PennHip’ you can read more about the how and why of this images. 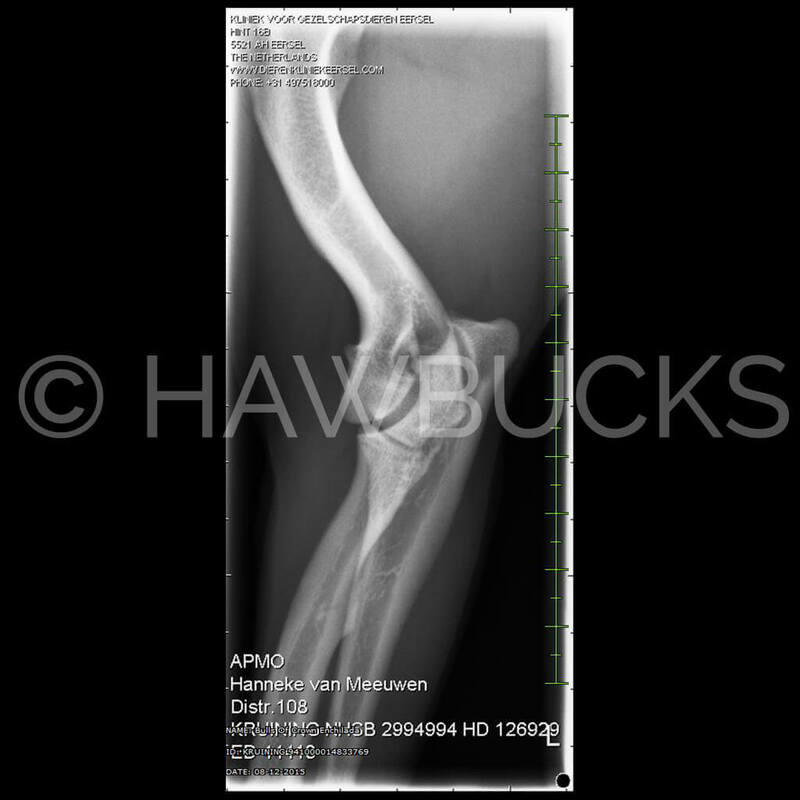 Elbows: In the tab ‘Elbow Dysplasia Examination’ you can find more information about this. In total about 10 x-ray images are made from a dog that enters our breeding program.Again we think it is very important and useful to share this information publically. 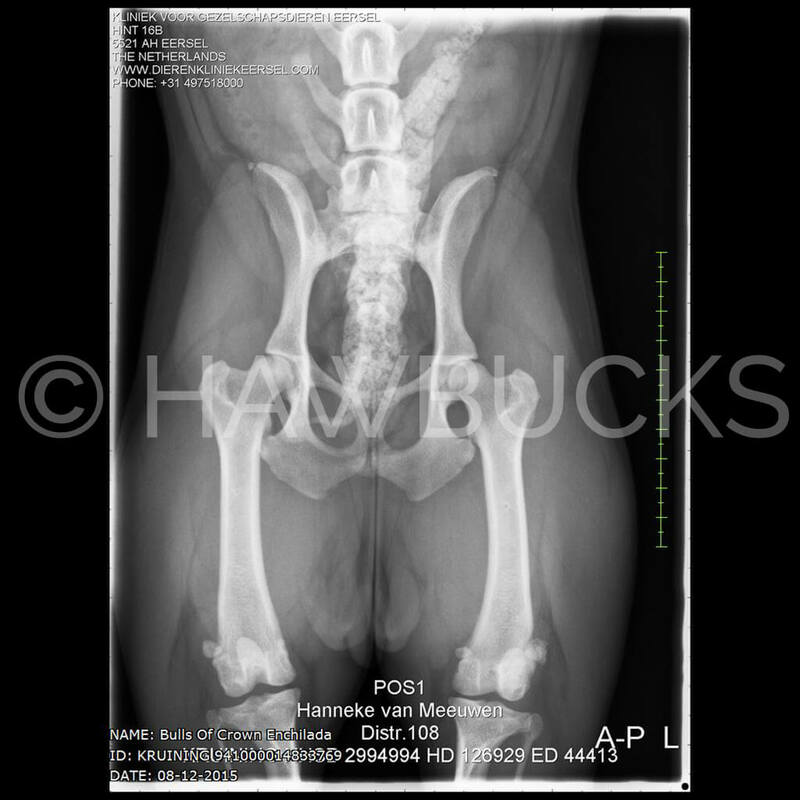 This is why all x-ray images (and all other health test results) on the personal page of the dog. If you would like the original images in full size, please contact us. We are happy to send them to you. OFA published a list that contains data about HD in every dog breed. If a breed is ranked number one on the list, HD is very common. If the dog is ranked very low HD is not that common. The list contains 173 dog breeds. French Bulldogs are ranked place 21. Of course this is way to high! The percentage French Bulldogs tested dysplastic is a whopping 28,9%! That is almost 1 in 3 French Bulldogs.. This is why we test our French Bulldogs for HD in an official way. You can read more about HD in French Bulldogs on this page. The x-ray is judged by a panel of 3 specialists. The panel judges the hips on the shape of the hip sockets and femural heads, the depth op the sockets, the juncture between the sockets and heads and they look for the presence of bone growths along the edges of the joints. An indicator for the quality of the hip joints is the so called ‘Norberg value’. The higher the Norberg value, the deeper is the joint in the socket. If the joint is nice and deep in the socket usually it is very firm, which gives less change for bone growths of other problems. In a normal hip joint the Norberg value is between 30 and 40. 40 is the highest value. A dog with a low Norberg value has shallow sockets and/or a bad juncture of the joint elements. The score HD A is not given then. A normal or even high Norberg value does not automatically mean the dog has good hip joints. The evaluation is also dependent on other aspects, such as the juncture of the joint elements and bone growths. There is a direct link between the results of the bone growth evaluation and the eventual result overall. Mild bone growth (rate 1) will automatically lead to HD B evaluation. Moderate bone growth (rate 2) will automatically lead to HD C and severe bone growth automatically gets a HD D result. Conformational changes can also occur. Usually this is a flattening of the front edge of the hip socket. Presence of this phenomena is noted, but it usually does not affect the end result. All data collected together determine the end evaluation. It is possible that one element makes for a lower score, but also multiple elements combined can determine the end result. The information on the certificate tells you all. After judging you will receive a certificate. This states the official result. HD A (=negative): The dog is based on the x-ray declared clear of HD. This may not mean that the dog is no carrier is the disease. PennHip is a relatively new, reliable method to determine the quality of hips in dogs. This happens with x-ray images and a so-called distractor. It is a method developed in the United States by the University of Pennsylvania. The PennHip method may only be used by veteranarian who are certified by the University. In the tad ‘Hip Dysplasia Examination’ you can read why we value hip testing so greatly. 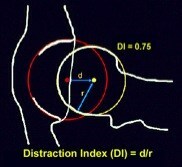 PennHip relies on a different principle than the traditional HD examination: the Distraction-Index (DI). The chances of getting osteoarthritis increase as the hip joint is less tight in the socket. More space in the hip joint means more chance to osteoarthritis. PennHip measures this space in the hip joint: under anesthesia and with the help of a PennHip distractor is checked how far the hip can come out of the socket. The degree of spacing gives an estimate for the chance of developing HD. The big advantage of this method is that PennHip can be done in puppies that are 16 weeks old. Well before a dog may produce it first litter. This is how the odds of offspring with HD can be dramatically reduced. How does the PennHip method work? 3 x-ray images are taken. On the second image the hips are pressed into the sockets, the optimal position is measured. This is called the compression image. On the third image the distractor is used to pull the hips out of the socket. This is called the distraction image. The x-ray images are digitally sent to the United States and assessed by the specialists in the University of Pennsylvania. All images from across the world are assessed here on the same way. The results are stored in a database. The owner of the dog receives a certificatie that shows the distraction-index of its dog. Also the breed average is noted on the certificate. A breeder can see how their dogs scores compares to other dogs in the population. I think this result asks for a little explaining. 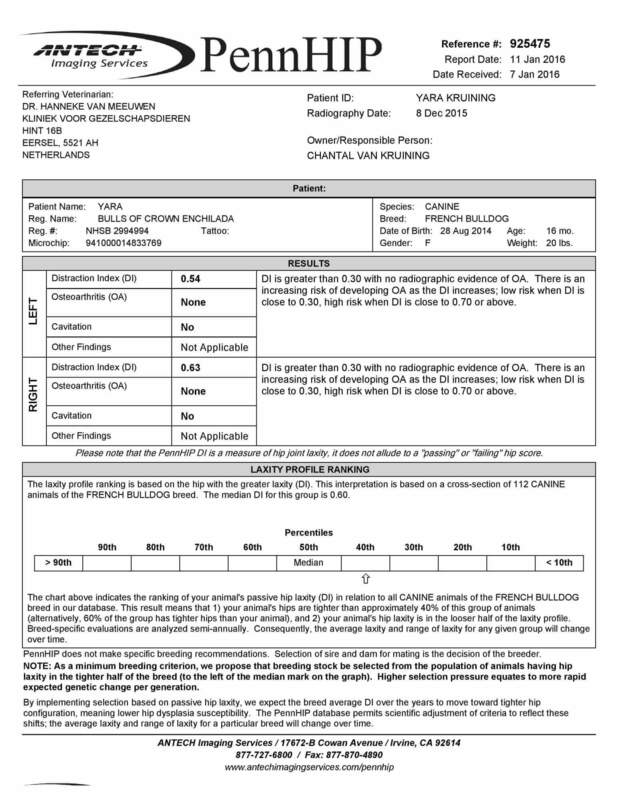 Not many people often see a Pennhip result. 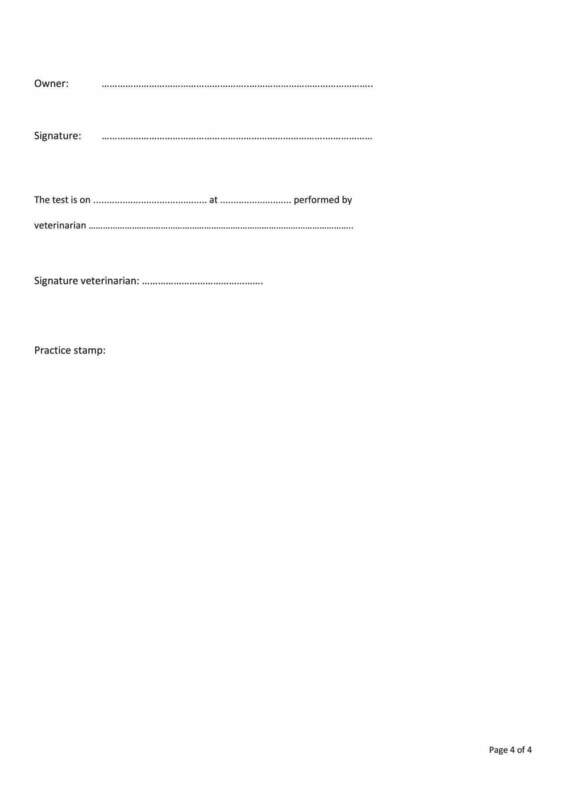 The result is given per hip, that is indicated on the top half of the document. The Distraction Index (DI) varies from 0 to 1. 0 is tight hips and 1 is loose hips. Yara has a DI of 0.54 on het left hip and 0.63 on her right hip. Also are her hips checked for other abnormalities. Yara has none at this moment. De bottom half of the result is a comparison with other French Bulldogs that are Pennhip tested. At the time of judging there are 112 French Bulldogs worldwide with a Pennhip result. 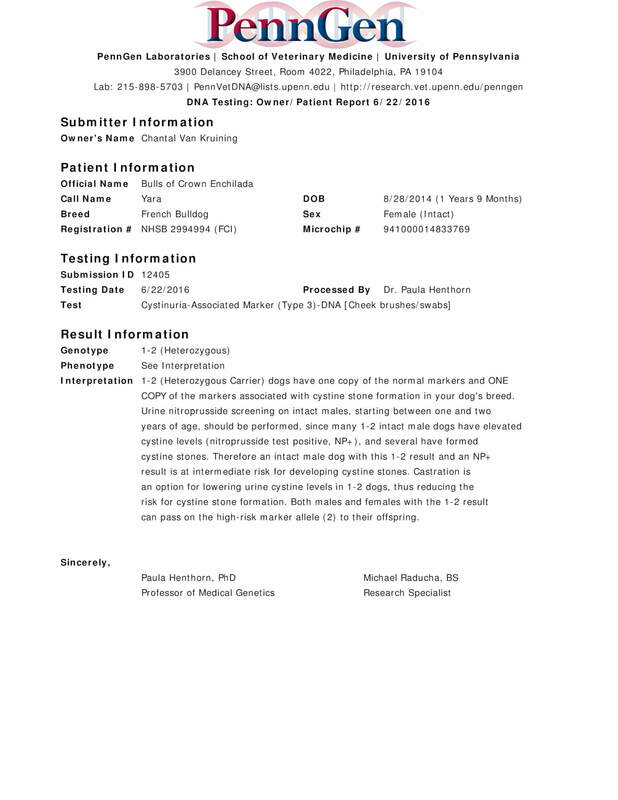 Pennhip also records the average breed result. For French Bulldogs the average result is 0.60. That makes Yara her left hip tighter as breed average, and her right hip a bit looser. In this comparison is looked at the hip that is most loost. With Yara that is her right hip with a DI of 0.63. The comparison shows that Yara is located in the 40th percentile. It means that 40% of French Bulldogs have at least one looser hip then Yara. 60% has tighter hips. I have chosen for Pennhip next to official hip results because the judging is very different and they look at different things. In official hip results what determines the result is mostly the depth of the hip sockets and bone abnormalities. 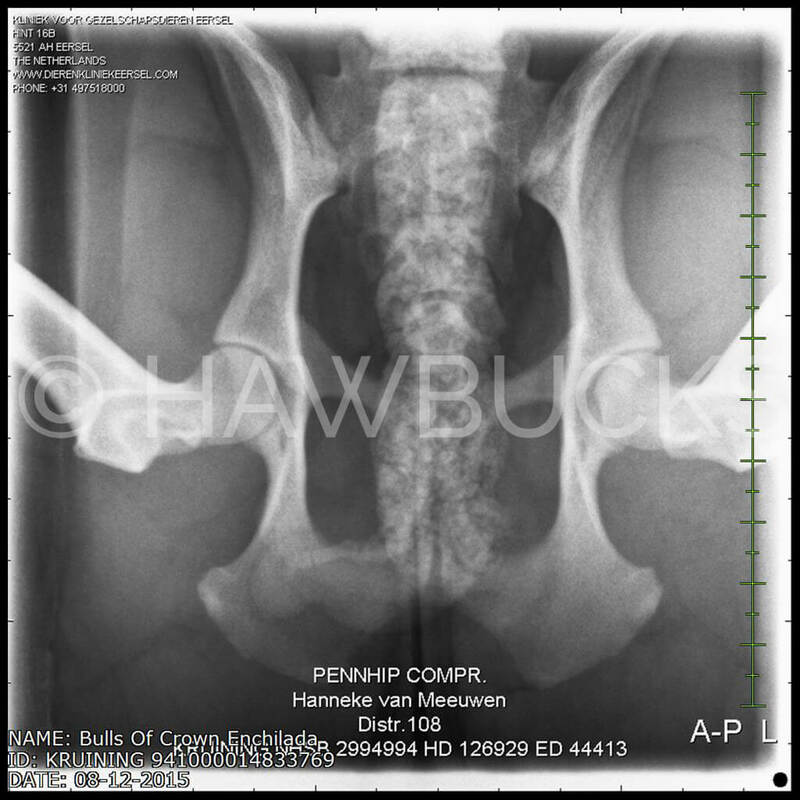 Pennhip results are an indication of how loose or tight the hips are. 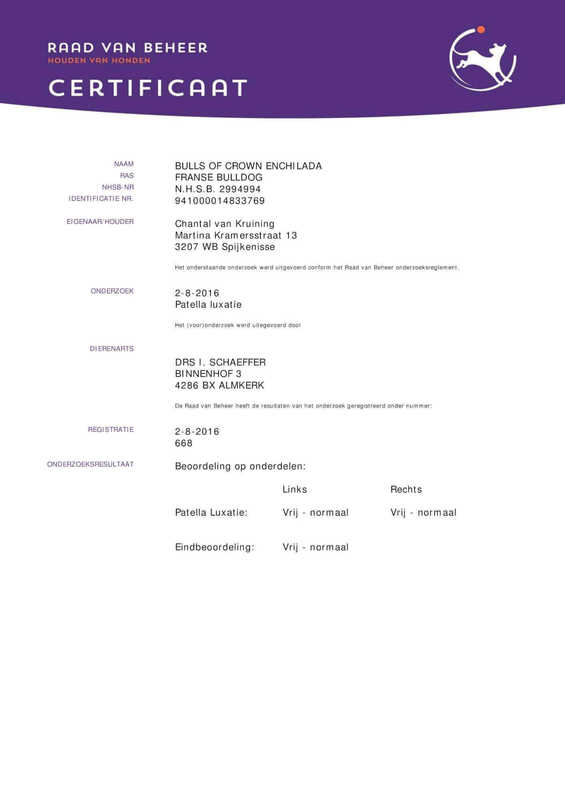 Yara her official hip result from Raad van Beheer is HD A. 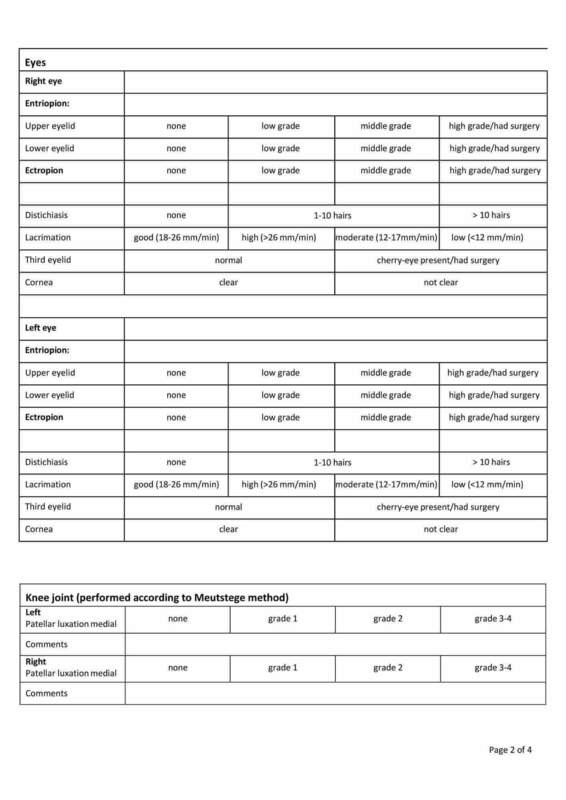 If you want to know more about the assessment of that score, you can read about it in the ‘Hip Dysplasia Examination’ tab. Next to the official HD exam we also perform an official Elbow Dysplasia (ED) exam on our dogs. French Bulldogs put 70 to 80 percent on their weight on their front legs, so they have a lot to take on! We think it is important that such a big part of the body is without abnormalities. ED is a development disorder of espacially the cartilage in the joints. It can be heriditary, but environmental factors can also play a big part. Some dogs can have discomfort from a very young age because of ED. In other dogs severe deformities lead to crippling at an older age. 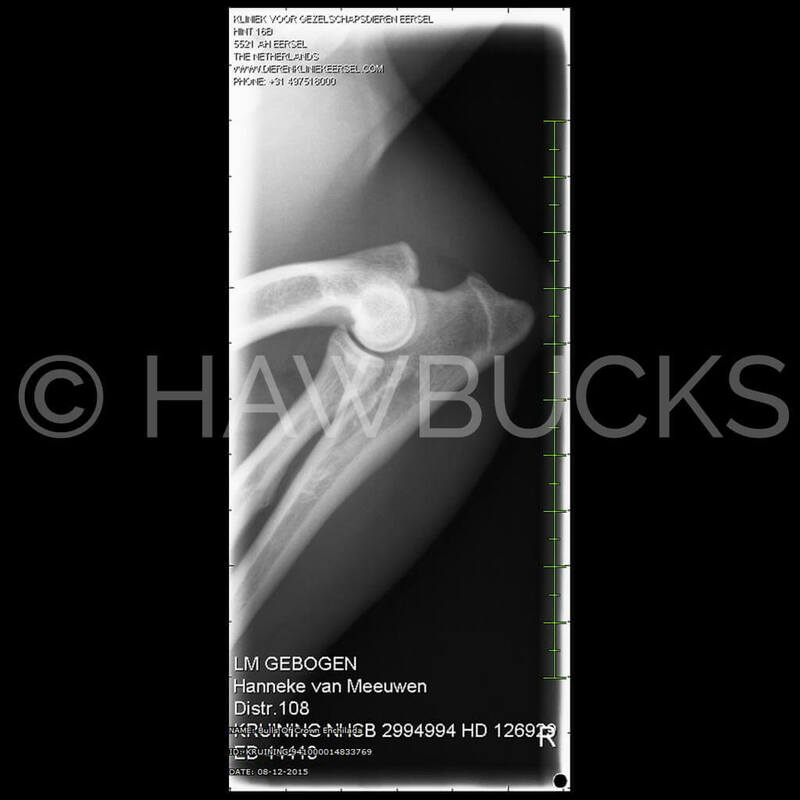 For the ED examination 4 x-ray images are taken; 2 from each elbow. The veterinarian sends these images to Raad van Beheer (the Dutch Kennel Club). The pictures are then assessed by a panel of 3 experts. After assessment the owner will get a certificate. Only dogs with an FCI pedigree can get an official ED-result. According to the rules of the FCI (Fédération Cynologique Internationale) the dogs had to reach the age of 18 months before ED is assessed. OCD (Osteochondritis dissecans): the release of a piece of cartilage from the humerus. LPA (Los processus anconeus): the release of a piece of cartilage from another place of the ulna. Incongruence: not good ‘fitting’ joint because of an abnormal ratio in radius and ulna. Several conditions can occur on the same joints. The permanent character of the changes. Pain and cripple while rising up and right after. Crippling imporved after a few steps. Relapse after too much efforts. When determining ED results the Raad van Beheer follows the guidelines from the “International Elbow Working Group”. The weakest joint sets the end result. On ground of the x-ray images it is impossible to predict for dogs that suffer from ED how it will affect them later in life. This depends of the nature and sevirity of the condition and the use and movement of the individual dog. 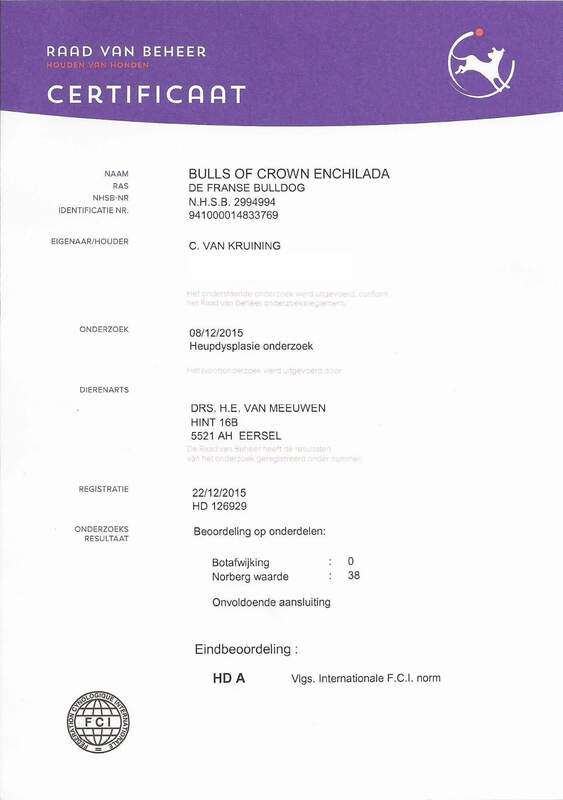 Starting August 1st the Dutch Kennel Club administers Patellar Luxation tests. This means that you will receive an official certificate from the Kennel Club with the result and the tests must me performed through a certain protocol at a veterinary specialist. When an official testing protcol exists I think it is nice to follow it. This way there can never be any confusion or discussion about the results. The specialist vets all work following the same protocol. Patellas Luxation is a condition from the kneecaps. The kneecap slides out of its groove. This can be very painful for the dog. Patellar Luxation is common in French Bulldogs. On this page you can read more about Patellar Luxation, just click on the tab that says ‘Patellar Luxation’. For this examination the dog has to run a little bit up and down in front of the vet. The vet looks at the way the dog walks. After that the dog is examined further on the table. The exam is without any form of anesthesia. The vet checks if he can move the patellas (kneecaps) or if he can push them out of their groove. There is also checked if the dog has no pain anywhere in the knee joints. After that the dog is put on his side and the checks are repeated. The kneecap is not possible to be moved from the groove of the femur with detailed examination. The kneecap is easily moved sideways to the edge of the groove, but not past it. Only with sideways pressure on the patella is it moved (in- and/or outwards) out of the groove and it returns, after releasing pressure back in the groove spontaneously. The patella luxates spontaneously outside the groove in- or outward and also returns in to the groove spontaneously by twisting the lower leg. The patella lies (permanently) outside the groove, inwards or outwards, but it is possible to place it back in the groove manually. The patella lies permanently outside the groove, in or outwards and it is not possible to return it back in to the groove. 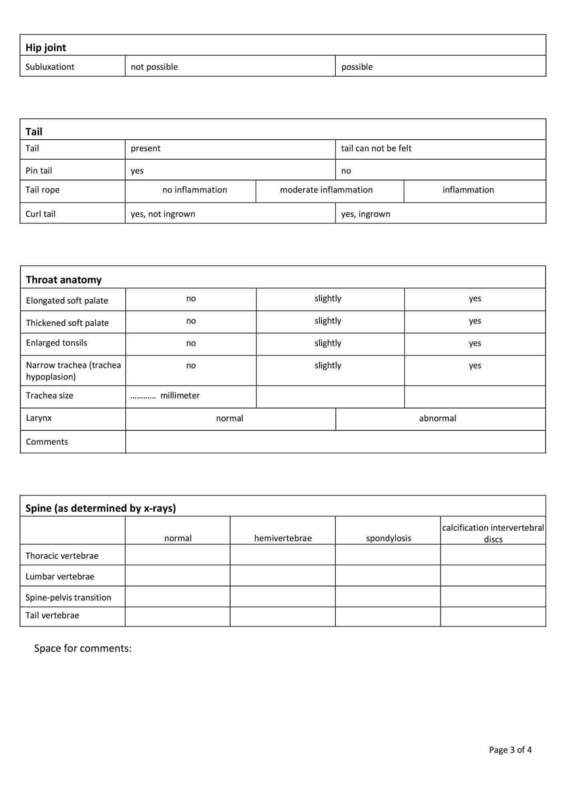 Dogs that previously had surgery for Patellar Luxation automatically are graded 4. After the objection period has expired, the research results will be published on the Kennel Club website. After the exam the results are announced immediately. Because the French Bulldog is a dwarf breed the odds on heart defects are increased. Heart conditions are often not seen from the outside. We think it is important to have insight in this through a heart ultrasound included with a Doppler research. This is performed by a specialist. In Doppler ultrasonography the movement of parts, in this case blood cells, are converted in peaks or in colours. This way one can make a distinction between blood vessels and other structures in the chest or abdomen. Also, among other things, can constrictions in blood vessels and leaking cardiac valves be traced. In a constricted vessel the blood flows faster. Different heat conditions can be found with the Doppler method. It is much used in ultrasonography. During the ultrasound the dog lies on its side on a spacial table, the dog is not anesthatized. The ultrasound device is placed on different locations on the chest, this gives the specialist different angles of view. Several measurements will be carried out. The specialist also listens to the heart with a stethoscope. Certificate of the Cardiac ultrasound with Doppler assessment. The ECVO test is an eye examination. Because different eye abnormalities occur in French Bulldogs it is wise to test for these officially. Read more about these conditions on this page. ECVO means European College of Veterinary Ophthalmologists. This is a licensed European organization that specializes in eye reseach in animals. 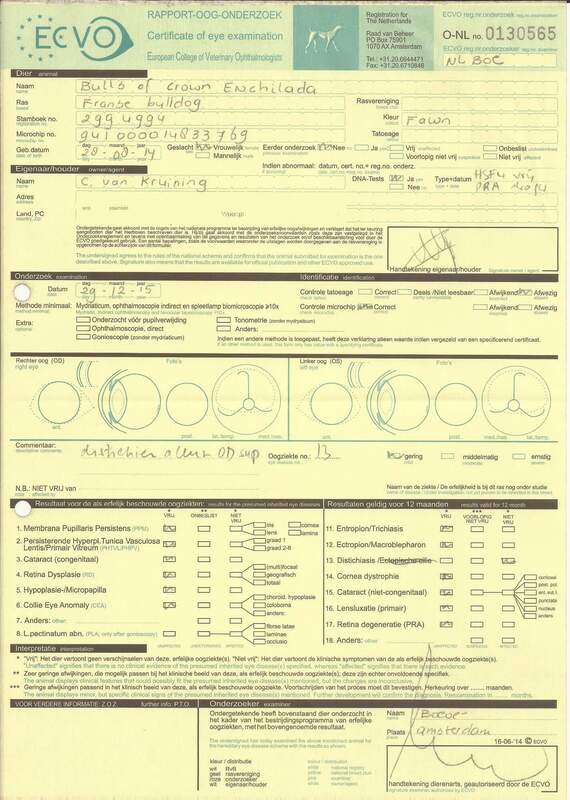 In the Netherlands eye specialist are joined by this organisation and the use the same result form. If you are not familiar with breeding it is a form with a lot of difficult names on it. We intend to explain the form and try to tell you what to look out for when breeding. We recommend ECVO testin animals before breeding them, after all is an eye abnormality not always shown in birth and it can occur later in life. Below is the ECVO result of Yara as an example. The eye specialist will draw the found abormalities in the eye profiles. Also is checked for the degree of the abnormality. The block below it is full of names. These are the eye abnormalities that are tested for in ECVO examination. The Embark test is a very elaborate test. Hunderds of diseases and abnormalities are tested, and all of them came from a cheeck swab. One of the conditions in the MyDogDNA is Heriditary Cataract (HSF-4). The genetic variety is also calculated in the dog. The more genetic variety the better, it means there are less copies of genes present in that dog. The genes of the dog are also mapped amongst other dogs of the same breed. You will see very clearly where your dogs stands genetically in the population. Because so many diseases are tested for, it is very likely to catch a disease before in become a problem in the breed. The test is performed on a cheek swab, this is ieal non-invasive testing. The swab is sent to a laboratory in the USA. After 6 weeks the result follows. It contains of no less than 12 pages! Also included in the profile are some colour loci and other appearance related things. We do not breed for colour, but it is funny to know how to predict the colours of the offspring. We think an Embark profile is very valuable. All the dogs we intend to breed will posess an Embark profile. Degenerative Myelopathy occurs in French Bulldogs. According to some researches even 20% of the population is carrier of this condition. Degenerative Myelopathy (DM) is a fatal progressive neurological condition on the spinal cord in dogs. It is comparable to ALS in humans. Dogs with DM will usualle show signs of the disease when they are 6 or 7 years old, but some show symptoms a lot later. From the first sign of the disease to the end usually takes about 6 to 18 months. DM starts with weakness and loss of coordination in the back limbs. First one leg and then the other. De dog drags and wiggles with the back legs and can even trip. The nails wear down and damage to the leg can follow, with infections as a consequence. Later, when the paralization worsens the dog will fall down, espacially on slippery sufaces. Walking gets more difficult. A dog that is in good condition can still run (as long as the other leg is still viable). Incontinence mostly means the last stage in the disease. In the end vital organs will be affected. The development of the disease is dependent on the fysical condition of the dog and environmental factors. With DNA testing a test can be performed for DM, but not all DNA-markers are found for this condition. This means that the outcome of the test is not 100% certain. We think it is very important to cooperate in research to find all the genes responsible. This is why we test our dogs for Degenerative Myelopathy. More information about Degenerative Myelopathy can be found on this page. Cystinuria is not long ago ‘discovered’ in French Bulldogs. Not so strange, because the condition only affects intact, adult males. Because of this it has been unnoticed for a long time. 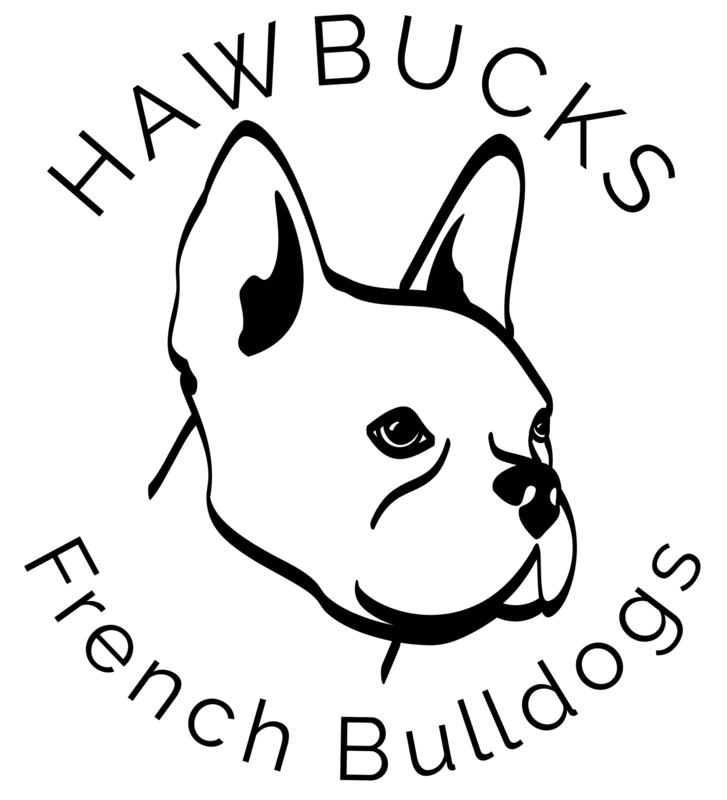 No etimated are known yet that show how many French Bulldogs are affected by this disease. There are different types of bladder stones in dogs. Struvite, Oxalate, Urate and Cystine. Struvite and Oxalate can be formed when the Ph of the urine is not optimal. Urate is an inherited disease in Dalmatians. Cystine stones are also know for a while in various other breeds like Newfoundlanders, Mastiffs and English Bulldogs. And recently in Fench Bulldogs a breed-specific variety, Type 3 Cystinuria. Most of the males are often castrated and this is also the treatment for this condition. When stones are formed in the bladder of an intact male will this be unnoticed at first. When a larger number of Cystine stones is formed it could block the urethra. A blocked urethra means that the dog can not urinate. The urine builds up in the bladder until the bladder ruptures. Symtoms are lethargia and pain. If the stones remain untreated the dog will die. In a surgery the stones can be removed. When the dog is also castrated during this procedure it will prevent the forming of new stones. Males that are tested Affected can best be castrated when they have stopped growing. Castrated males do not make Cystine stones! We think it is important to keep ‘up to date’ in the development of the DNA tests. So much is possible nowadays that we can use to make the next generations healthier. This is why we have added this DNA test to our testing protocol. It is frightening how little healthy and stabile French Bulldogs exist and how different health test results are interpreted. Breeders often pretend that their French Bulldogs are perfect. This is not only a phenomenon in backyard breeders but also in the same amount in pedigree breeders, It is clear that the statement ‘ healthy’ changes per person, per breeder and per breed club. It is not exeptional for a French Bulldog to die at a young age with many health defects. After all, they can get old with HD, hemivertebrae and bad airways. It is misleading to say that this dog was healthy during his life. Until now it was usual to make x-rays from all vertebrae. This includes all neck- thoracic- and loin vertebrae. On an x-ray is only the outside of the vertebra visual. On the image below you see an x-ray on the left and a CT image on the right. The x-ray image is made from a lateral view and on the CT you can see a cross-cut. On the x-ray image it appears that the vertebra is ‘ neatly’ broke en in 2 pieces. If we get to the CT image, however, it shows a much more complicated fracture that has multiple fragments. When you are performing a health protocol with only x-ray images the hemivertebrae will be classified as minimal or severe. Location, experience and the number of deformities all play a part in the decision to breed with this dog or not. Spondylosis, athritis and calcified interverbral discs are also part of this decision. Experts can also put the deformities in 2 categories: hemivertebrae and shortened vertebrae. In a hemivertebrae is 1 side of the vertebrae shorter, thus showing a vertebra that is triangular in shape. With shortened vertebrae the vertebra is less elongated as the other vertebrae. On this page you can read more on the anatomy of the vertebrae. An assessment of the vertebrae through an x-ray image is much less accurate than an assessment with a CT scan. When you make a CT scan you can also see the spinal cord with the nervous tracts. This way we can see if nothing is narrowed from within. A seemingly small hemivertebrae lead to a narrowing of the spinal cord. This deformity is invisible on an x-ray. In comparison: a spinal cord without deformations. The last few years quite some French Bulldogs are known with spinal issues. Because of this many receive medication or surgery and some had to be euthanised unfortunately..
CT scans show that badly developed vertebrae often are the culprit with problems in the spinal cord. The natural pillows are missing, this makes that fragments can break off of the vertebra. This causes a lot of pain. The consequences for these dogs and their offspring are often terrible. Because of these reasons we chose to perform CT scans on all our dogs we hope to breed with. This way we can look at a threedimensional image of that is really going on in the spine! 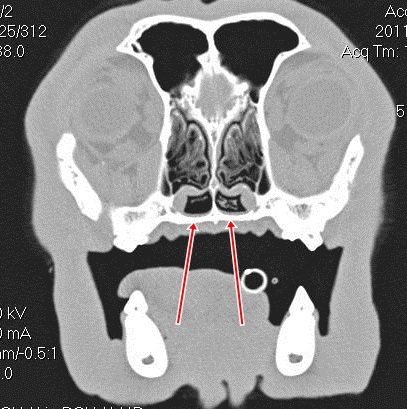 Right: CT image from the palate. The same male, 5 years old. The words most often used in breeding French Bulldogs is good breathing! People show off their great results that will give wonderfull offspring. Is free breathing not one of the basic need in every living creature? Breathing free of complications in every situation is only possible when different elements are in harmony with each other. The nostrils, nose passages pharynx, larynx, tonsils, tongue and trachea all have to be clear from deformities. This must be evaluated individually in every dog. One look at the throat area at a young age is not always enough. Expecially when the dog is still growing gives this absolutely no accurate information. It is astonishing what images you can get in a CT image. It is a fact that nor the nostrils, nor the length of the nose is an indication of free breathing. Nose passages of a French Bulldog before surgery. Considering the health improvements that are made the last years have given no real results we should be thinking of new and better ways to make the breed more healthy. The argument of anesthesia is nonsense. The risk of anesthesia is minor and breeders don’t seem to have a problem with it whilst doing a (planned) c-section, weird enough. Lately we have seen quite some French Bulldogs diagnosed with Syringomyelia and Chiari Malformation. Too much in our idea. We think it is irresponsible to not test on this anymore. Syringomyelia is one of the many conditions that can occur in French Bulldogs. It is also called ‘ scratching disease’, because scratching in the air is one of the symptoms. Since a couple of years it is know that the deformity is present in the breed, only people did not know what it was. Many French Bulldogs got diagnosed with allergies of neck problems while there war no evidence of it. Veterenarians were not know with Syringomyelia at the time. Now many know of the existence of the disease. Unfortunately this condition can not be seen from the outside. Only through MRI scans you can get a diagnosis. By scanning you can make a responsible combination. But guarantees are not given unfortunately. The inheritance is very complicated. Two MRI-clear parents can produce offspring that is not clear. But also two affected parents can produce clear offspring, although that is not so commom. A breeder that scans can never guarantee a clear puppy because the parents are clear. Of course it is obvious that chances are greatly reduced when buying a puppy from tested parents. What is Chiari Malformation (CM) and Syringomyelia (SM)? The problem arises because of a small backside of the skull and, therefore, too small of a hole in the back. This is called the Chiari Malformation (CM) malformation. Chiari Malformation in most cases does not cause any problems, but can also cause serious symptoms without the presence of SM, but in almost all cases it is the Syringomyelia that causes the pain. The Chiari Malformation forces the brain to fall into the backhole. As a result, the fluid normally circulating through the brain and the spinal cord can be blocked, causing fluid pressure to rise, causing the formation of voids filled with liquid (syrinx) in the spine. This is called Syringomyelia. In most cases, these animals remain completely free of symptoms, despite the fact that SM is detected by an MRI scan. It is estimated that a small percentage of the dogs with SM detected via MRI also actually show physical symptoms or show them. The exact percentage is not known. Of course, every dog ​​who has pain is one too much! The cavities (syrinx) and the pressure that exert the cavity on the nerve endings can cause neurological side effects that can be very painful. The most common is scratch on one side, but it can occur on both sides. There are no abnormalities visible on the skin or ear. Affected dogs are also sensitive to head, neck and forelegs and often scream for pain without clear reason. The pain can be related to the positioning of the head and some dogs eat and sleep preferably with the head up. Some seriously affected young dogs develop a scoliosis, this is a spinal curve. Finally, seriously injured dogs walk wobbly with the hind legs and/or experience weakness of the front legs. The phenomena usually arise from the age of six months. Many dogs lead a relatively normal life, but some dogs are deteriorating and are euthanized around middle age. There are therefore clearly different degrees of severity of the disease. 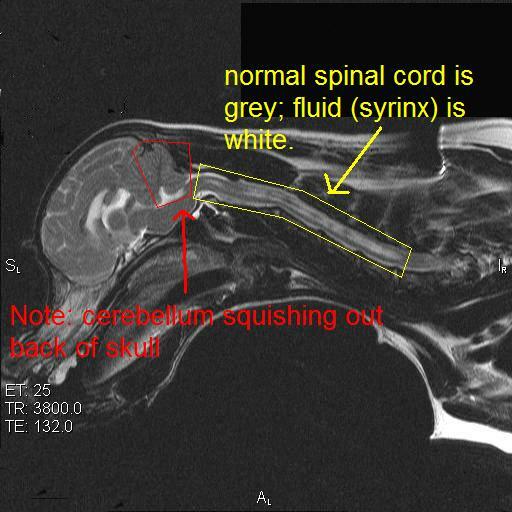 The only certain way to determine the diagnosis of Syringomyelia and deformity of the hindhole is a MRI scan. MRI is Magnetic Resonance Imaging. Several genes probably play a role. Further DNA research is required to determine the genes involved, but no DNA marker has been found.